As everyone knows, all that glitters is not necessarily gold. However, it's nevertheless impressing when you open the Shiner Gold Pomade can and see its amazing color. Happily, the color isn't the only aspect which makes this Americanpomade popular amongst many Rockabillies and Greasers. It's easy to style and almost easier to wash out, as it is a water based pomade. In addition it offers a perfectly firm hold and a breathtaking scent. Now you have more than enough good reasons to use Shiner Gold Pomade. 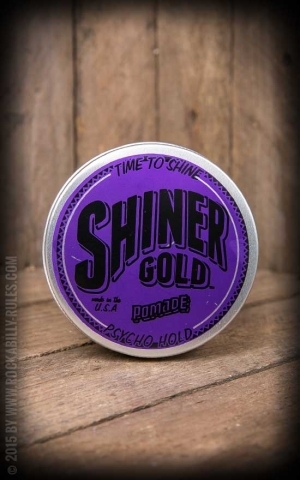 Shiner Gold Pomade is available in several golden versions and firmness levels. A delicate cocos scent ensures that your and your girlfriend's nose is pampered. Moreover, the Shiner Gold convinces with firm hold without sticking. You can therefore restyle your hair any time - just perfect when you're on the go and want to fix your parting. The company even offers items for beard care, such as mild and soft shaving cream. It's a bit different in color, but warrants the Shiner Gold's gold status with awesomely high quality. 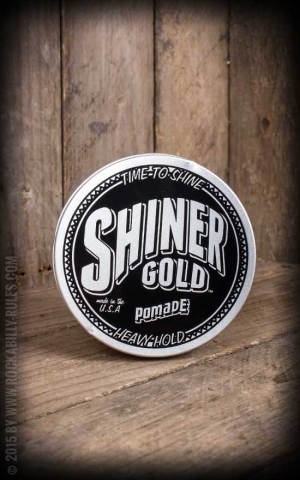 Discover Shiner Gold Pomade and beard care in our shop!